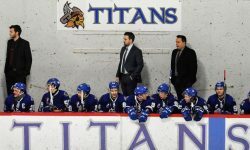 The Temiscaming Titans are extremely pleased to announce the arrival of players with several years of junior experience to the line up. Arriving over the weekend was Kyle Rowe, a 21 year old forward from Bowmanville, Ont. At 6’1″ and 195lbs, not only does Kyle bring some size up front but also some scoring punch. In his last three years Kyle has suited up the Elliot Lake Bobcats (NOJHL), Chatham Maroons (GOJHL) and Mattawa Black Hawks (…NOJHL). Playing in 69 games over this period, he had 19 goals and 19 assists and a total of 72 PIM. Titans next addition comes in Thursday Sept. 11 by the way of Lac-au-Saumon, Qc in the form of centerman Jason Berube. Berube is 5’11” and 170lbs. He played in the NOJHL with the Cochrane Crunch in 2014/15 and accumulated 15 goals, 37 assists and 32 PiM in 52 games. Previous year he dressed for the La Ronge Ice Wolves and Fort Francis Lakers of the SIJHL as well as the Elliot Lake Bobcats of the NOJHL. He had 8 goals, 7 assists & 14 PiM in 35 games. In Kyle and Jason, the Titans gain some scoring punch but most importantly some more leadership and experience. Also they have some playing time together in Elliot Lake. With the Titans home opener only 4 days away these additions will be welcomed in the dressing room.